Also Frigga, Frija, Fricka. Goddess of marriage, daughter of Fjorgyn (Iord ). Her husband is Odin. Her home is called Fensalir [The Ocean Halls]. Although she knew all things because of her place next to Odin on his high throne, she never revealed her secrets. Frigg spun long pearly webs of cloud from her jeweled distaff, which shown in the night sky as the constellation of Frigg's spinning wheel. Her symbols were heron feathers (discretion) and keys (housewifery). 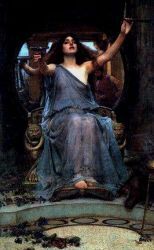 Freyja and Frigg share many of the same myths, and both have been linked with Odin. It is possible that they both originate from a common Earth Mother deity. Frigg is also connected to Saga, who may actually be an aspect of Frigg as Memory.